Philadelphia Phillies starting pitcher Vince Velasquez made one of the best, yet one of the most painful defensive plays of the MLB season in Saturday’s game against the Washington Nationals. 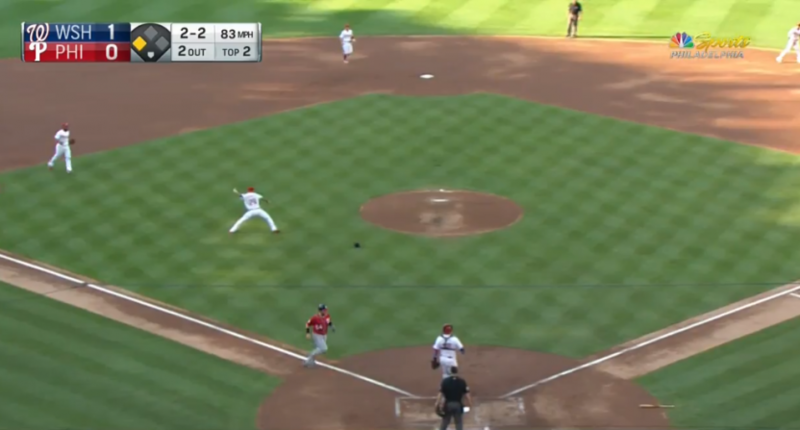 The Nats had a 1-0 lead and a runner on third with two outs in the second inning, when Adam Eaton hit a 96-mph line drive off Velasquez’s right elbow. That’s the pitching arm for Velasquez. Incredibly, Velasquez picked the ball up and fired a strike to first base with his *left* arm to get Eaton and keep a run off the board. And then Velasquez collapsed to the ground in a ton of pain. After seeing that throw, you won’t be surprised to learn that Velasquez has some experience throwing left-handed. He even played some center field left-handed in high school due to bone spurs in his right elbow. The injury forced Velasquez out of the game, but the good news is that x-rays reportedly were negative. Oh, and Velasquez’s remarkable play ended up being a very big one. The Phillies went on to win the game by one run, 3-2.